Top 50 Most Valuable Indian Brands shows unrestricted 'right to play' has made India a brand powerhouse. MUMBAI: HDFC Bank is India's most valuable brand, with a value of $9.4bn, according to the first ever BrandZ Top 50 Most Valuable Indian Brands ranking. HDFC Bank has a network of over 3,400 branches and 11,250 ATMs in more than 2,100 cities. It is popular with its 28 million customers for launching mobile apps designed to make banking easier, and running literacy, education and skills training programmes in rural areas. The No.2 brand is Airtel, India's leading wireless telecommunications brand and the fourth largest mobile operator in the world with nearly 300 million customers, while India's largest commercial bank, State Bank of India, is at No.3 in the ranking. Services businesses (Banking, Telecoms and Insurance), which are the nerve centre of today's Indian economy, are prominent in the ranking. Seven of the Top 10 brands, and 30% of the Top 50 brands, come from the service sector. Financial services stand out, with the 12 banks and insurers in the ranking holding the largest proportion (37%) of total Brand Value. Analysis shows these brands have built value by successfully achieving scale – both in geographical reach and the diversity of their offerings. Telecoms, Personal Care, and the Food and Dairy sectors also feature strongly in the Top 50. The data shows that these brands – along with the other FMCG brands in the ranking – excel at connecting with Indian consumers. Carried out by marketing and brand consultancy Millward Brown in conjunction with WPP, the valuation is the only one in India that takes into account consumers' opinion of brands to calculate the contribution that product brands make to business success. 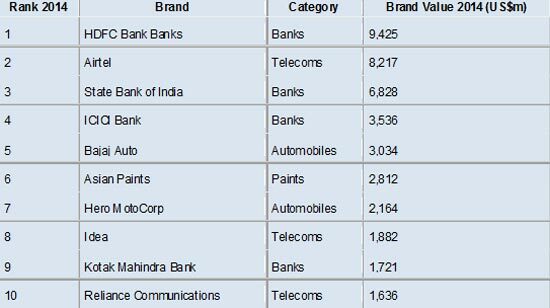 The combined brand value of the BrandZ Top 50 Most Valuable Indian Brands is almost $70bn. The diversity of brands in the ranking – enabled through the country's openness and 'right to play' for businesses – indicates that India is a fertile market for building valuable brands, irrespective of age, origin, structure, category, ownership or even price range. The Top 50 come from 13 different categories. Seventeen are multi-national corporations (MNCs), 26 are private Indian brands and seven are state-owned brands. The average Brand Contribution (a measure of the impact brand alone has on value) of the Top 5 brands is far higher than the overall average of the Top 50, illustrating the positive impact that building a strong brand has on the financial valuation of the brand. These brands create powerful connections by being meaningful to consumers, and differentiating themselves from others. Being meaningful and different builds value – India's most valuable brands are highly relevant to consumers and differentiate themselves through service, new offerings and brand experiences. One such example is personal care brand Colgate (No.28) – even after 70 years in India the brand has successfully remained relevant and continues to differentiate itself from the competition. 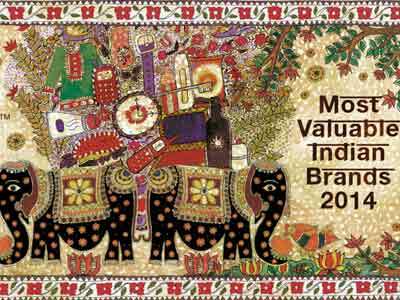 India has evolved into a brand powerhouse – its Top 50 most valuable brands have as much Brand Power (consumers' predisposition to choose that brand over another) as the global Top 50, and are ahead of the other emerging economies. Private sector players and multinational corporations dominate – together these contribute around 85% of total brand value. They have succeeded by nurturing a strong relationship with Indian consumers. Megabrands lead the game – like other fast growing economies, India is dominated by a handful of big brands or companies that own stables of brands: the Top 5 account for 45% of the ranking's total value. Their tremendous scale and ability to cater to a wide spectrum of the population has translated into financial gains. 'Balanced brands' is the mantra – brands that are able to build both strong connections with consumers and business scale that leads to the creation of financial value are contenders for entering or rising up the BrandZ ranking. Three out of the Top 5 Indian brands demonstrate this balance. Consumer technology is 'the category waiting to happen' – there are currently no home-grown consumer technology brands in the Top 50, but this category is on the verge of emergence. The presence of Indians working in the sector globally is high, and consumer-facing technology brands founded by young entrepreneurs have already started to gain ground. 'Indianizing' products and services is important – the many successful international brands in the ranking have taken the time to understand Indian needs and tastes and adapt to them. Noodles, food seasoning, soup and sauce brand Maggi (No.18), personal care brand Colgate (No.28) and beverage brand Horlicks (No.20) are masters at this – and are thought of as Indian brands by most consumers as a result. Old and new sit side by side – living with one foot in the ancient world and one in the modern makes consumers equally receptive to heritage brands (Bajaj Auto, No.5, established 1945) and new brands (Airtel, No. 2, established 1995). More than a quarter of the Top 50 brands were created after the economic liberalization in 1991 while Dabur, No.22, was established 130 years ago.